In this new edition of this must-read guide to personal satisfaction and fulfillment, renowned business consultant and motivational speaker Susan Ford Collins shows individuals how to achieve success in their lives. She outlines 10 essential Success Skills and provides easy-to-learn methods for immediately putting them to use. Whether you are changing jobs or relationships, starting or managing companies, families or countries, these 10 skills will guide you step-by-step not just to the successes other people want for you, but to the completion of your own projects and dreams. Also available in hardcover and in blue cover as Book One of The Technology of Success Book Series. — Christiane Northrup, M.D., author of New York Times bestseller "Women’s Bodies, Women’s Wisdom"
While shadowing Highly Successful People, Susan Ford Collins discovered something all leaders need to know: Success and leadership have gears that must be shifted up and down, at the right time. 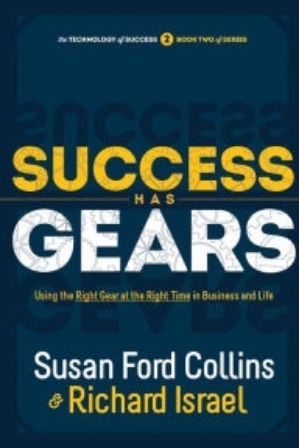 In Success Has Gears, Susan Ford Collins and Richard Israel teach you to literally transform your leadership overnight. Success Has Gears presents 20 case studies in which leaders and team members operate in the wrong gear at the wrong time... and it reveals the real cost of these result-reducing, team-destroying errors. Success Has Gears provides the tools and understandings you need to shift your approach so your gears, and those of people you work with, mesh. When you and your organization use the right Success and Leadership Gears at the right time, your effectiveness, productivity, creativity will rise to the next level. And the impact of your contribution rises too. Business leaders literally shouted, “Why didn’t anyone ever teach me this before? It’s game changing.” And they are right. What are you waiting for? This book shows you how to reach a place where true leadership, creativity and innovation can grow… even in a chaotic workplace. Have you ever wondered which of the trillion things you do for your kids actually contribute to success in their lives? As parents in today's always-on world, it seems like we are killing ourselves in an effort to make sure our kids' have everything they need, but we leave out the most important element of all: giving our kids happy, satisfied, well-balanced parents! In trying to meet the demands of our lives, we work longer and harder with more stress and less satisfaction—is this the model of "success" we want to demonstrate to our children? Remember: You are leading by example. Ask yourself: Is success only measured by your outside accomplishments? What makes some individuals far more successful and more effective as leaders, with peers and co-workers, and at home with their kids? This book will help you answer these critical questions and discover what it means to Parent for Success!